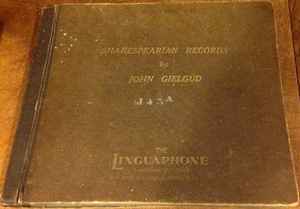 Around 1930 John Gielgud recorded various Shakespearian recitations for the Linguaphone Company. They were released in a 5 record album, with no catalogue number and the individual records are noted by matrix number only. The cover is in book style, i.e. it folds open like a book and contains 5 bound sleeves for the records.